If there would ever be a cannabis strain that could be served as desert after a hefty lunch or dinner, it would be Caramelicious. It took some serious crossing of strains to make a plant that’s as marvelous as Caramelicious – it’s a three-way cross between Maple Leaf Indica, Blue Black, and Afghan Kush – and it looks like it gathered all of the best traits of its genetic ancestors. This strain has it all – the looks, the taste, the yield, the ease of growing, simply put – Caramelicious is appealing to all senses and all types of marijuana enthusiasts. Caramelicious grows into a short plant, with large, dark green fan leaves which give it a bushy look. While the height of the plant might not be too impressive, a closer look to the stem of the plant shows that Caramelicious is a sturdy and resilient cannabis strain, one that would be able to deliver good yields even in harsher climates. 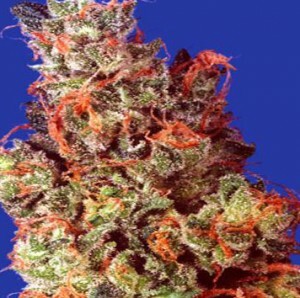 Caramelicious produces large, thick buds, very frosty and with a lot of fine orange hairs, which give of the impression of a plant that’s no joke, and with a THC count of 20%, Caramelicious is as serious of a cannabis strain as they get. The sweet caramel smell of Caramelicious is noticeable well before the plant is ready for harvesting. Upon lighting it up, users find the taste of Caramelicious to be very sweet, with undertones of vanilla and honey, and with the trademark caramel taste being very much present in every puff. Caramelicious hits your mind and body alike, it hits it fast, and it hits it hard, with a very relaxing and happy high, bordering on euphoric, which won’t leave you spaced-out or scatterbrained. 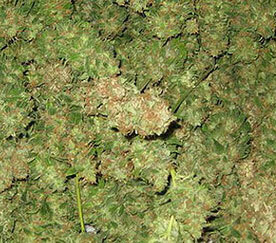 When used for medical reasons, Caramelicious works best for dealing with pain and stress. There’s not much to say about growing Caramelicious because it’s one of those plant that even newbies can grow with a lot of success. It grows equally well on both soil and hydro, but anyone looking to amplify the taste should grow it on soil and be very careful when adding nutes, as they can make the smoke harsher and kill some of the trademark sweetness of this awesome cannabis strain. Another thing that makes Caramelicious great is that it grows outdoors even in colder climates, and because of its small size, it can easily be hidden among already existing plants. Caramelicious seeds are available online from shops from around the world. If you want to buy Caramelicious seeds online, a single web search will give you more results than you’ll be able to check out – but check out more than one to get the cheapest Caramelicious seeds deals.